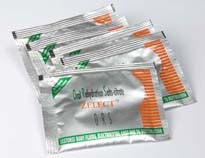 Zelect®, Zinc with Oral Rehydration Salts (ORS) is the first of its kind to be introduced in India, based on a WHO approved formula. Zinc as an adjuvant with ORS reduces episode duration and severity in acute diarrhoea. Bharat Biotech has documented data that proves that zinc fortified ORS is superior to ORS alone in the management of acute diarrhoea.